The Klarstein VitAir Fryer is a futuristic hot air fryer, which revolutionises the kitchen rituals of deep frying, grilling, and baking: this kitchen master combines all of these into one multifunctional device. Using an infrared halogen heater, the VitAir cooks meat, fish, and vegetables in a healthy way in record time. Whether fresh or frozen ingredients, individual dishes or a complete menu, this useful appliance can handle it all without preheating or defrosting, and most importantly without the extra addition of oil or fat. The revolutionary technology uses hot air and ventilation to ensure even heat distribution, while the juices remain intact. The result: the VitAir saves up to 60% of your cooking time, all the while ensuring that your food does not dry out and keeping its juices and crisp. Temperature and running time can be manually set, with temperatures ranging from50 ° to 230 ° C and a cooking duration of up to one hour, plenty of time to prepare a wide variety of delicacies. In addition, pre-programmed settings can be selected for the precise preparation of chips, grilled chicken, cakes, pizza, steak, and shish kebab. 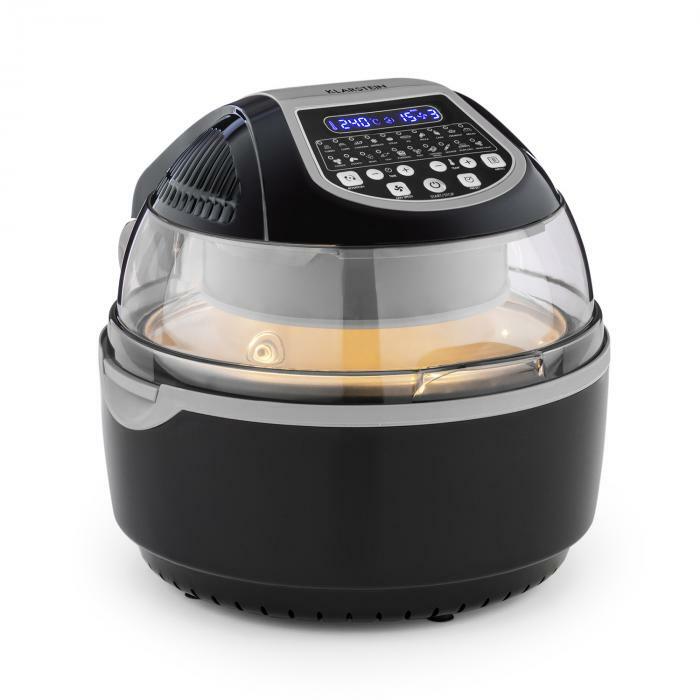 The timer function allows you to program the start time of the halogen oven, so you can wake up to freshly baked bread or come home to a freshly finished dinner after a long stressful day at work. The fryer comes with various complementary accessories, including a 3D cage grill for chips and a skewer for grilled chicken or shish kebabs that can be horizontally clamped to the device. The switchable rotation allows chips and skewers to achieve optimum roasting and a uniform doneness. For making pizza there is a round plate, while other foods can be cooked on the grill rack. The stylish, domed housing is made from double-processed plastic and features a window with a 310 ° panoramic view of the cooking process. The non-stick coating of the pan reduces cleaning time, and cleaning in the dishwasher is also possible. With a moderate footprint, the Klarstein VitAir fryer can find a place in almost any kitchen. Small cooking spaces benefit even more, as the air fryer eliminates the need for other cooking devices by combining multiple functions into one.